In the past few months, one of my laptops running with windows XP responded very slowly to both double-click and right-click. Double-click to open a photo less than 1 KB takes more than a minute while the right-click sometimes might freeze the Windows Explorer. Everything works fine if I use the program to open it. This problem is not specific to any type of files. Unlike others, this laptop didn't install many applications. It doesn't even have Microsoft Office on it. But it carries adobe reader, Nero burning software, AVG anti-virus, Spybot Seach & Destroy, and the default graphic card software by Intel. That's. It was used to be super fast. Using ShellExView for diagnostics and disabling every single Context Menu Handler, Icon Handler and Property Sheet don't help. Finally the System File Checker (sfc) command fixed the problem. Be sure to have your Windows installation CD ready before you issue the above command. Now I enabled all the extensions that were disabled via ShellExView. Everything is back to normal now. In this article, it mentions Context Menu handler for Intel® Graphics could be the possible culprit. But it isn't in my case. The problem I had was not only right-click but also double-click. Thus, if you have the similar trouble, you may have to trial-and-error to rule out the issue. Using ShellExView to find the root cause is extremely time-consuming because every change you make require a reboot in order to see the actual effect. Luckily I finally have my problem solved. Oftentimes we encounter problems when we perform update using LoadDataRow or rollback data using RejectChanges after the Delete method. Why do the methods sometimes not do what we want? Googling a solution for LoadDataRow, we may find that most people resolve the update performed by LoadDataRow must call DataTable.AcceptChanges first. Does this solution work for you 100%? There are still some unresolved posts left unanswered. They follow the solution to call AcceptChanges but the problem still exists. Why? Deleting a DataRow and then immediately performing RejectAccepts to rollback cause us to receive System.Data.RowNotInTableException. What is it going on? Is the DataRow marked as Deleted? Why can't I rollback? The above problems are related to either the RowState of a DataRow or if we set up the constraints on DataTable correctly. Assuming there is no constraint problem, the DataRow must be either Unchanged or Modified when we perform an update using the LoadDataRow method on an existing DataRow. The same principle applies to the RejectChanges after calling the Delete method. Apparently, the operations requires an Original version existed for the DataRow. When the RowState of DataRow is Unchanged or Modified, an Original version of the DataRow has been created/existed. Thus, any operations after it won't cause a problem. If you receive a System.Data.ConstraintException in regard to System.Data.UniqueConstraint.CheckConstraint, please ensure the primary key set up properly. Most likely, setting the Unique property of a DataColumn without primary key to true will cause this problem to occur. If you receive a System.Data.ConstraintException in regard to System.Data.DataTable.EnableConstraints, please ensure an Original version existed for the DataRow. It means the RowState of the DataRow is still in the state of Added and you need to commit changes first by calling the AcceptChanges method to update the state to Unchanged. Similarly, if you receive a System.Data.RowNotInTableException when you try to roll back the DataRow after having called the Delete method, a AcceptChanges call is required before the Delete method. After AcceptChanges, an Original version of the DataRow is created and the RowState of the DataRow is set to Unchanged. From this state onwards, any modification including the LoadDataRow method, or calling the Delete method and then the RejectChanges method can be performed. To sum up what the RowState means is described in the following table. The DataRow is created but it hasn't been added to a DataTable yet. Since it does not exist in a DataTable, no operations can be performed at the DataTable level. The DataRow is added to a DataTable but the DataTable has not accepted changes yet. At this stage, it requires AcceptChanges to create Original version for other update operations including rollback. The DataRow has not changed since the last AcceptChanges call. At this stage, an Original version of the DataRow has already existed. Thus, any operations can be performed without a problem. The DataRow has been modified since the last AcceptChanges call. Like Unchanged, an Original version of the DataRow has already existed in this stage. A DataRow with Modified row state can continously be modified but the RejectChanges will only roll the data back to the last AcceptChanges call. Any modification made in between is disgarded because the Original version of the DataRow is only pointing the copy when the last AcceptChanges is called. 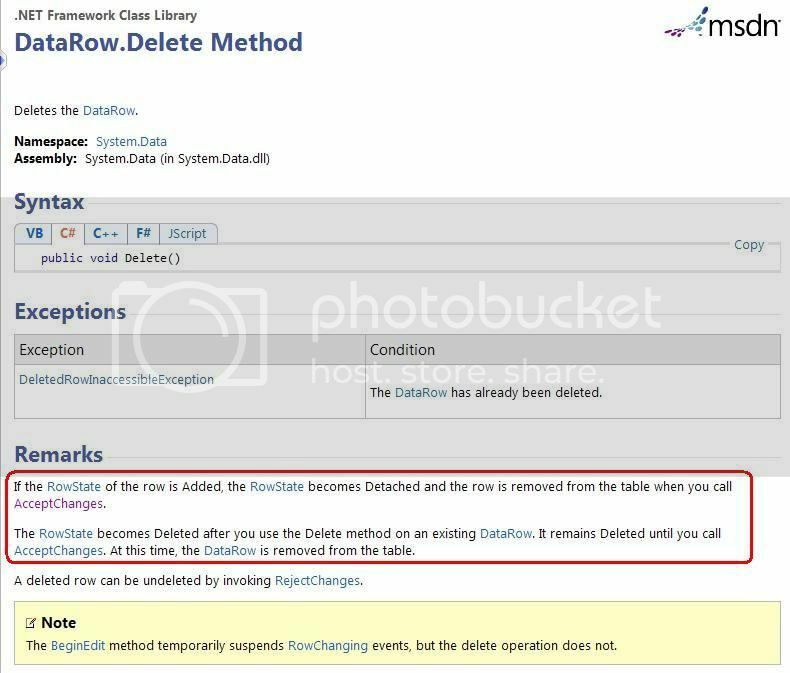 The DataRow was deleted by using the Delete method of the DataRow only when the RowState of the DataRow is Unchanged or Modified. I also attach some test results I conducted for reference. The following 3 tests [ Test 1 | Test 2 | Test 3 ] tell you about in which situation you can roll back your data and when you cannot. This page is generated by the application developed in C# under Visual 2008 Profession SP + .NET 3.5 SP1 on Windows XP Professional SP3. Set up a DataTable with 2 rows; so the initial RowState of all DataRows is Added. Without AcceptChanges, immediately delete the 2nd DataRow using Delete method. The RowState of the deleted row is not Deleted but Detached; The result is different from what it is said in the documentation [According to MSDN, it is currently supported in: 4, 3.5, 3.0, 2.0, 1.1, 1.0]. Please also see the test foot notes in blue. Then RejectChanges after deletion; unfortunately, the System.Data.RowNotInTableException is received. Version: Current doesn't not exist. Version: Default doesn't not exist. This row has been removed from a table and does not have any data. BeginEdit() will allow creation of new data in this row. By definition of DataRow.Delete method, the row should have been marked as Deleted. According to this, this bug should have been fixed in VS 2008. Apparently, it still exists. Or there may be a typo in the document. Originally it said, "If the RowState of the row is Added, the RowState becomes Detached and the row is removed from the table when you call AcceptChanges." Perhaps, it is meant to say, ""If the RowState of the row is Added, the RowState becomes Detached and the row is removed from the table when you call RejectChanges." Then everything will become and make more sense. Because DataRow.RowState is set to Detached, we cannot roll it back by using RejectChanges. Then AcceptChanges, which changes the RowState from Added to Unchanged. Delete the 2nd DataRow using Delete method. The RowState of the 2nd DataRow is marked as Deleted now. After deletion using Delete method, the RowState is set to Deleted. Thus, RejectChanges can be used to roll back the DataRow to the point where the AcceptChanges method is last called. The RowState of the deleted row is also rolled back to Unchanged. Everything looks exactly like before deletion. Start BeginEdit ... EndEdit block to modify the 2nd row. Change the FirstName from Rex to Susan. The expression column LastName and FirstName remains unchanged until the EndEdit method is called while FirstName is modified before calling EndEdit. Then delete the 2nd DataRow using Delete method. The RowState of the 2nd DataRow is marked as Deleted now. Interesting of this test is that the "LastName and FirstName" column remains unchanged [Bloomer, Rex] after the FirstName has been modified to Susan. The "LastName and FirstName" column is an Expression column set up by expression that contains the values from both FirstName and LastName columns. Changing FirstName will not refect the change immediately in the "FirstName and LastName" column until EndEdit is called. In this test, I will use LoadDataRow to perform content update on a DataTable with or without primary key constraint. bool AcceptChanges will be passed as a parameter in LoadDataRow(object, bool). For result using LoadDataRow(object, LoadOption), please see this. The DataTable used for the test has the five (5) columns and initially is populated with 2 sample data rows.